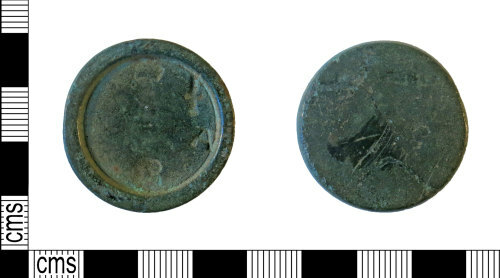 A complete copper alloy trade weight of Post-Medieval date (AD 1714-1820). The trade weight is from a stacking set, it is a plano-concave lathe turned disk. This example is the 1oz weight. The obverse of the weight has four designs stamped into it; 1). A crowned G for one of the King Georges 2). Sword for the City of London, (Guildhall mark, the sword of St Paul) 3). 'A' for avoirdupois and 4). Ewer or coffee pot, the mark of the London Founder's Company, which verified weights. The metal is a light green in colour with a smooth patina.